I’ve always wondered if there was an “official” list of all the countries composing what we call “The MENA region”, and I found that there are more than one point of view about this subject, and there are more than just one MENA region (Regional “MENA”, Economic “MENA”, Politic “MENA”, etc.). In my case, I just wanted to know what the “startup MENA” was? What are the countries composing this ecosystem? And after a short discussion on twitter about “if Turkey was part of the MENA region or not”, I decided to suggest a list and readers can correct me if I made a mistake somewhere. 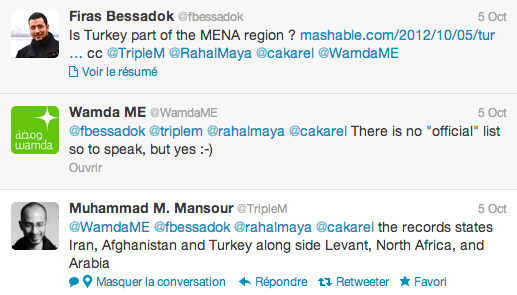 First of all, “MENA” region means Middle-East North Africa region. And here we speak about the startup ecosystem, so the question would be: What are the countries in this part of the earth that interact with each other in order to build a strong and sustainable environment that helps creation and innovation in the tech-industry? Countries marked by a (?) are those i don’t really know if they have a startup activity or not.